Serving all your Land Service needs on Newfoundland's Avalon Peninsula for over 30 years. We offer a full range of land services, both Public & Private. We are your FIRST and LAST choice for land service needs. Beginning in 1982, James Martin Surveys set out to establish a land survey company that put the client FIRST. Quality, honesty and integrity were always at the forefront. After 30+ years, Martin Surveys still practice these same principles; because you, our loyal patrons, are our prime concern. 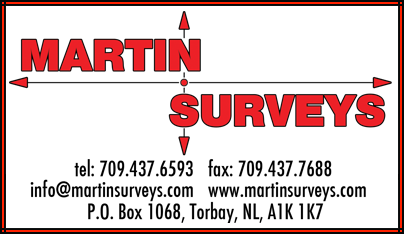 Martin Surveys & Land Services Inc. is based out of beautiful & scenic Flatrock, NL and is 100% family owned and operated by the Martin family; Jim with sons Brian, Stephen, Christopher and Brian's wife Corrina are the heart & soul of the entire operation. We offer a full range of land surveying services including legal, construction, topographic, subdivision/road design/layout, crown land, water lots, cottage lot development, house location/layout, land development and land management. Right click and choose; "Save Image As..." to save the virtual business card to your computer! Meet The People Behind Martin Surveys!